It’s a funny thing to hold a book you’ve written in your hands for the first time. You examine the cover closely and feel the heft of the book. As you open it and you smell that new book smell, you start to wonder about typos and grammatical errors and all the things that can slip past the many sets of eyes that look at your manuscript as it goes through the editing process. And then, as you read a chapter or two, you can’t help but think — Did I write that? And you try to imagine where it will sit on the shelf in the bookstore — what books will it sit next to — and you hope that the spine and title will make people want to pull it out from between the books. Today Steve Chindgren had another falcon killed by a golden eagle while hunting sage grouse in Wyoming. Steve flew Tava for eight seasons. Tava was having a great year and had just knocked his 22nd grouse of the season out of the sky after going up a thousand feet. 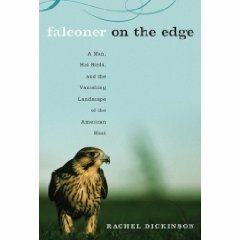 The eagle killed the falcon while he was dispatching the grouse.